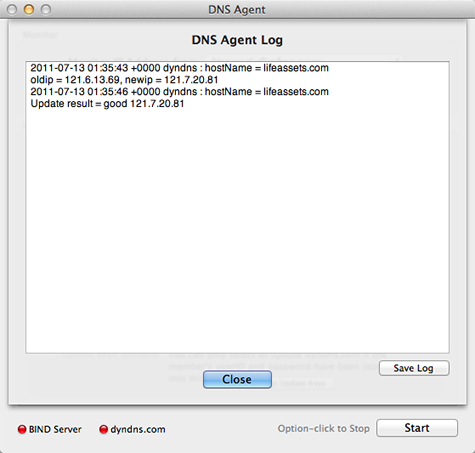 DNS Agent is suitable for use in a machine with a dynamically assigned IP address. 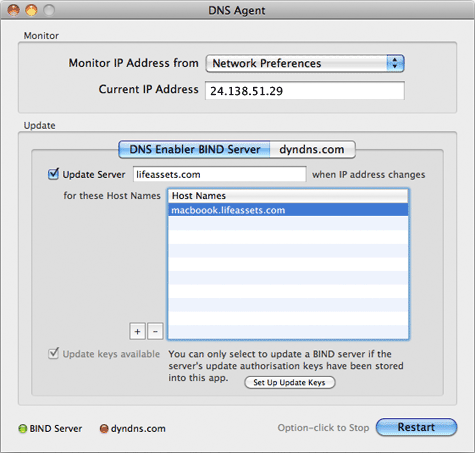 Whenever the IP address changes, DNS Agent will update the DNS Server that is managing that machine's domain-name to IP-address mapping, thereby keeping that machine's domain name in sync with its IP address at all times..
DNS Agent is able to update threekinds of DNS Servers - BIND name servers set up by DNS Enabler, or dyndns.com and easydns.com servers. Once you have launched the latest version of DNS Agent, save the current config using the File->Save menu item, do a De-Install from the Help menu, which removes all the previous cruft, and then quit and come back to the app. You'll then get the config files, libraries and the other stuff that will work with Mojave. You need to be an admin-level user to use DNS Agent and the machine it is running on must already have a domain name managed by some DNS Server. 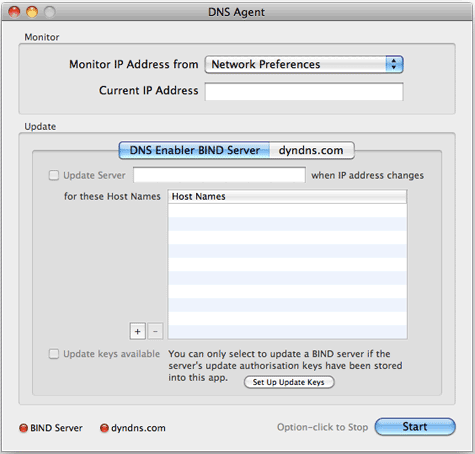 After logging in, depending on whether the DNS Server is managed by DNS Enabler , or one managed by dyndns.com, go to the relevant DNS Agent tab panel. Note : The DNS Server must be running DNS Enabler for Mojave, in order to have the dynamic DNS update capability. DNS Enabler can be made to generate an Authorisation Key for DNS Agent to use so that it can identify itself to the server as a valid client. 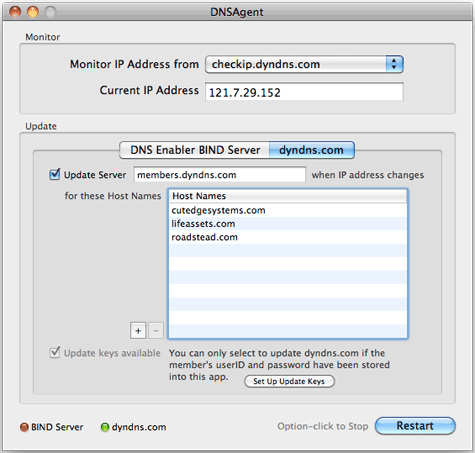 DNS Agent can monitor the machine's IP address as seen on its Network Preferences Panel in System Preferences, or poll checkip.dyndns.com for its public IP address if the machine is behind a router. The picture below shows DNS Agent with the Network Preferences option selected. Obtain an Authorisation update Key from DNS Enabler, copy it to this machine, and double-click on it. Read the DNS Enabler documentation, for information on how to obtain the Authorisation Key from the server and copy it to this client machine. 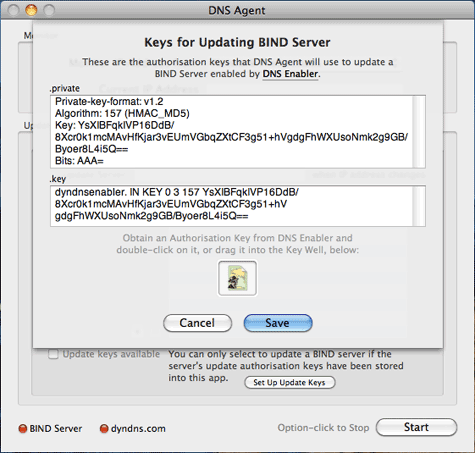 Click the Save button and you can now select the "Update Server" check box, below, enter the domain name of the DNS Server, enter the host name of the machine DNS Agent is monitoring, and click the Start button (which will then change its label to Restart to show that DNS Agent monitoring daemon is launched and running). From now on, whenever the IP address of this machine changes, the DNS Server will automatically be updated about the change. The DNS Agent daemon continues to run across system shutdowns and reboots. You don't need to have the DNS Agent interface open except to change its settings. Option-click on the Restart button if you need to stop the monitoring daemon and prevent it from starting up across system reboots. Updating a dyndns.com server is very simple. Select the dyndns.com tab panel. If your machine is behind a router, you would probably need to update dyndns.com with the machine's public IP address, which you can obtain by setting DNS Agent to poll checkip.dyndns.com periodically. 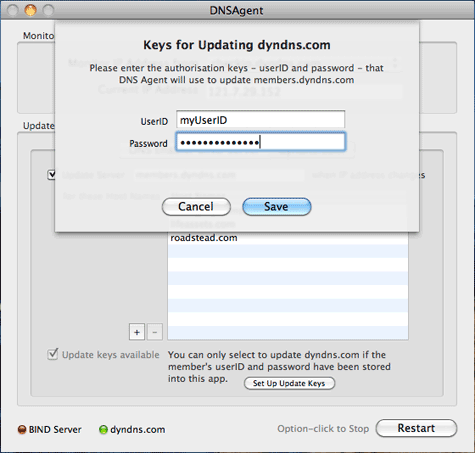 Once this key to dyndns.com has been entered, you can go back to the main dyndns.com tab panel to enter the host name (or names) for which this machine is known (to dyndns.com). Click the Start button to launch DNS Agent's monitoring agent. Whenever the machine's public IP address changes, dyndns.com's DNS Server will be updated. The daemon continues to run across system shutdowns and reboots. You don't need to have the DNS Agent interface open except to change its settings. Option-click on the Restart button if you need to stop the monitoring daemon and prevent it from starting up across system reboots. 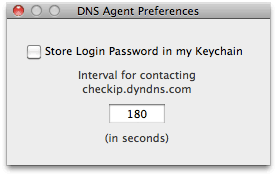 The frequency with which DNS Agent polls checkip.dyndns.com for your machine's public IP address is 3 minutes (180 seconds). This can be changed via DNS Agent's Preferences. The DNS Agent Log can be accessed via the Help menu. It will record the times when DNS Agent detected that the IP address has changed and whether it was successful in updating the DNS Server. You can de-install DNS Agent by using the last menu item in the Help menu. It will shut down the DNS Agent daemon, if it is running, and remove all files installed by DNS Agent (in /usr/local/cutedge/dnsagent). 9.0 October 2nd 2018. DNS Agent for Mojave released.